For Spring Summer 19, Belstaff embarks on the greatest journey of them all – the road trip – that iconic modern-day odyssey of escapism that tests the traveller’s courage, self-sufficiency and spontaneity in the pursuit of freedom. This collection takes inspiration from Robert Edison Fulton’s seminal travelogue, One Man Caravan, which documents the American’s solo round-the-world tour on a two-cylinder Douglas motorcycle between July, 1932 and December, 1933. It was this concept of the fearless, self-sufficient adventurer that when combined with Belstaff’s heritage for fabric innovation – once producing waterproof tents, capes that could turn into groundsheets and even parachute silk for the military – that became the idea for Belstaff’s most technical, functional and lightweight collection to date. While all of the iconic Belstaff silhouettes are present, including the belted Trialmaster, this collection is unique for its externalisation of the functional design elements, from bonded taping to zips and patch pockets. Spring Summer 19 captures the true adventurer’s spirit of Belstaff, being modular, packable, with plenty of storage and extremely lightweight. Technical innovation ensures comfort, while also retaining the most luxurious feel and look with the use of the finest natural fibres. The palette for Spring Summer 19 consists of a spectrum of neutral tones to complement the lightweightfabrications, moving through off-white, stone, sand, tan and khaki with flourishes of blue hues, solarized yellow, and a beautiful almond green. There is a subtle, washed-out or solarized finish to the palette that offers a warm, lived-in effect. This season’s outerwear is notable for a host of new lightweight cotton fabrications, combined with numerous unlined silhouettes that have become inimitable Belstaff shapes. Take the new waxed-cotton Trialmaster, Belstaff’s most iconic jacket, which this season comes with two patch pockets at the rear and with the original slanted breast pocket, providing additional functionality as per the traditional moto-touring jackets of old. It once again comes belted, just as the very first Belstaff Trialmasters were. Light, sun-bleached cotton styles in classic silhouettes such as the Trialmaster, parka and cape also feature the brand’s original check lining. The cotton exterior has been treated with a chemical extract that strips some of the dye from the cloth to create a unique worn-in effect, ensuring that no two jackets are the same. The women’s collection also features field jackets with badge details and oversized parkas with externalised taping for an elevated military look. Indeed, across both sexes, the lightweight cotton blousons have surfaced a number of interior details such as taping, patch pockets and zips. A more elevated genre of outerwear consisting of a blouson, hooded jacket and Explorer jacket is comprised of an extremely soft and lightweight cotton-linen blend fabric that is perfect for more considered wear in the summer. Elsewhere, blousons, bomber jackets and field jackets are constructed in a garment-dyed cotton with contrasted patches. femininity and an oversized parka that you can wear as a back pack as well complete the theme. Exploring the technical theme further in womenswear, Belstaff have also created an unlined, cotton-nylon rider coat with a snap belt, contrasting taping and laser-cut pocket details, providing a unique balance between heritage and technology. In Mens this also comes in a car coat and four-pocket field jacket. The same rider coat shape has been replicated in a shiny rubberised vinyl version in both pale pink and black, and features a bonded cotton membrane to feel soft and natural on the skin. 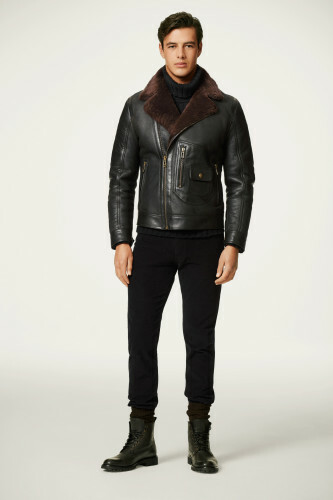 Finally, Belstaff has also continued to evolve the classic silhouettes with the most lightweight and technical fabrics used to date for Origins. Using an incredible new stretch ripstop, the brand has designed a minimal, laser-cut genre of outerwear featuring waterproof membranes, bonded zips, rubberised trims, and reflective details and external bonded contrasted tape for a very contemporary look as a parka, anorak and a cape. are new four-pocket, racer and Rider coat shapes. offered in a variety of neutral and pastel tones, including a rich almond green and pewter. The hand-waxed leather styles across both sexes this season have something definitively ‘biker’ about themthanks to a black-waxed technique on the exterior, giving the fabric an almost dirty lived-in patina. This leather comes in both blue and yellow. elsewhere in the collection. The women’s jersey offering also includes a military rib with a zipper for an athletic and easy-to-wear style. with black contrast soles, while there is also a winklepicker ankle boot with triple latches that is offered in black leather, stone suede and rich lezard tan.